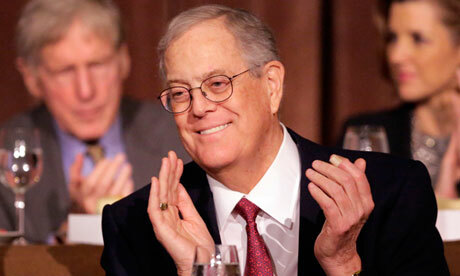 from major donors like David Koch, above, and food giant Kraft. Conservative groups across the US are planning a co-ordinated assault against public sector rights and services in the key areas of education, healthcare, income tax, workers’ compensation and the environment documents obtained by the Guardian reveal. The strategy for the state-level organisations, which describe themselves as “free-market thinktanks”, includes proposals from six different states for cuts in public sector pensions, campaigns to reduce the wages of government workers and eliminate income taxes, school voucher schemes to counter public education, opposition to Medicaid, and a campaign against regional efforts to combat greenhouse gas emissions that cause climate change. The documents contain 40 funding proposals from 34 states, providing a blueprint for the conservative agenda in 2014. In partnership with the Texas Observer and the Portland Press Herald in Maine, the Guardian is publishing SPN’s summary of all the proposals to give readers and news outlets full and fair access to state-by-state conservative plans that could have significant impact throughout the US, and to allow the public to reach its own conclusions about whether these activities comply with the spirit of non-profit tax-exempt charities. Most of the “thinktanks” involved in the proposals gathered by the State Policy Network are constituted as 501(c)(3) charities that are exempt from tax by the Internal Revenue Service. Though the groups are not involved in election campaigns, they are subject to strict restrictions on the amount of lobbying they are allowed to perform. Several of the grant bids contained in the Guardian documents propose the launch of “media campaigns” aimed at changing state laws and policies, or refer to “advancing model legislation” and “candidate briefings”, in ways that arguably cross the line into lobbying.